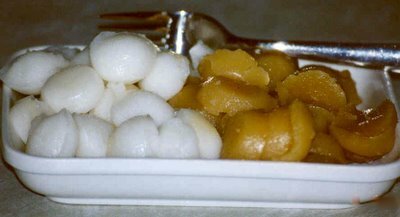 One of the two standard companions to pansit guisado, that stir-fried salty and greasy dried stick noodles that is a staple fare in birthdays and other parties in the province, is the Calasiao puto, these teeny-weeny moist and bouncy semi-flat rice balls Pangasinenses are quite proud of (the other one being latik). I grew up on Calasiao puto, and it, along with Manaoag puto, defined how puto should be for me. Needless to say, though I enjoy other kinds of puto made in and around the country, Calasiao puto is the special puto I hanker for and still serve during special occasions. Good thing the quality has not deteriorated over the years - in fact, it seems to have improved, the quality becoming consistent. This may be due to government efforts to promote the product, and regulating its production and sales. This puto is made and exclusively sold, of course, in Calasiao, a town in the central part of Pangasinan where the Pangasinan language is exclusively spoken. Calasiao is also the second pilgrimage town in the province (after Manaoag), being the home of the miraculous Señor Divino Tesoro. In front of the town plaza are lined up endless kiosks selling nothing but provincial sweets, the highlight and main come-on being the puto, heaped on the center of the table and sold according to weight, although until a few years ago it was sold by the number of pieces, the price pegged at a hundred of the sweet treats. Don't be daunted by this, because the Calasiao puto is the smallest of its kind, and one can easily finish half a kilo (or about 50 pieces) in one sitting (or maybe that's just me). It is made from rice, still in the traditional way - ground via heavy flat stone grinders, sweetened then steamed. 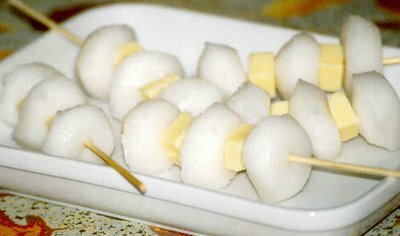 What you get is a small, glistening, moistly sweet white ball, embodying the perfect concept of makulnet (malagkit/maligat, I can't figure out the exact term in English and nobody I know knows either) that is a very far cry from the cake-like consistency and texture of other puto. I don't know if it is the rice used (grown in the area? ), the equipment used (worn by hundreds of years of use?) or the local water used to steam the puto, but the Calasiao puto can never be exactly reproduced outside of Calasiao, even in my hometown which is the neighboring town of Malasiqui. So beware! Just like how Bonuan bangus cannot really be bred outside of Bonuan, the "special Calasiao puto" you buy outside of Calasiao is probably just pretending to be the real one, although it may be a very close approximation. Unless, of course, you particularly know that the vendor bought the puto from Calasiao. To further illustrate, just recently a Calasiao puto-maker was brought somewhere else in the country to teach the locals how to make Calasiao puto. Result - a close copycat but not the real McCoy, and the sponsor, who spent for the puto-maker's airfare and accommodation, was disheartened. So this is just a long story to tell anyone out there who comes across this post and think of asking me for a recipe. Sorry. You can't make a Calasaio puto. Me, I resigned myself to that fact, and I enjoy puto whenever I go to Manaoag and Calasiao, or really go out of my way to buy for special occasions. Ordering in advance is not necessary, since the puto is made and available round-the-clock, 24/7. I guess total production for a day can feed the total population of the province, and Pangasinan is the second most populous in the country. As with other puto, it is good with cheese. In my family we serve it with grated cheddar/quickmelt cheese sprinkled on top of the heap, although I think this is unfair since the puto at the bottom do not get their fair share of cheese. I like them skewered on sticks like a barbecue with their individual cheese cubes. But, let me tell you a little secret, Calasiao puto is better spread with Kraft's Cheez Whiz, even the pimiento variety. The cheese spread is better attuned to the moistness of the puto than the dry cheese cubes. There is also a kutsinta variety, which is as moist and sweet as the original puto. Definitely mas makulnet than ordinary kutsinta. Bite-sized, too. Can anyone send me recipe for this puto calasiao...tnx.. I am here in Texas, USA more than 5 years now and I am dying to eat Calasiao Puto. Iy u can pls. send me the recipe. It is for my own cooking. I have no ambition to make business from it. I am from Pangasinan - grew up in Dagupan and relocated to grandma's place in Calasiao. Calasiao puto is the best puto ever. Nothing compares. I asked for the recipe from grandma, still waiting for her mail. I got addicted to this little rice cake the first time I went to the islands to marry my wife. It's to bad we can't get it in the states. But the last time that i was there I pigged out on it, the fresh fruit & bamboo shoot soup, mmmmmmmm. God, the wife, the kid & myself need to go back & charge our batteries up at her home in Calasiao. Hi Raquel, thank you very much! I'll be sure to take you up on that offer! Calasiao puto is the best of all the puto made in the Philippines. I like to eat puto with dinugoan & pancit. Can't wait until my next vacation to the Philippines. OMG! I miss calasiao puto..pls email me recipe at dgoodfind@yahoo.com. thanks so much! Hi Kai! Just found your blog post via the KCC event.And when I visited the Phil. last Feb.,I saw Calasiao puto on our way to the Manaoag shrine & I shrieked when I saw it on the sideways. I hadn't had this type of puto since childhood. Wish you could someday share the recipe! Thanks for the story, good information! I just got new messages from this blog. Like I said before. Pig out on Puto what your in the Calasiao area. Because your not going to get it anywhere else. I don't care if you get the receipe or not, it's not going to be the same. I've been trying to find it her in the states. NO DICE!! Get your fill while your there, because your not going to get it anywhere else.